You may be wondering, what is our plan for DCMs? 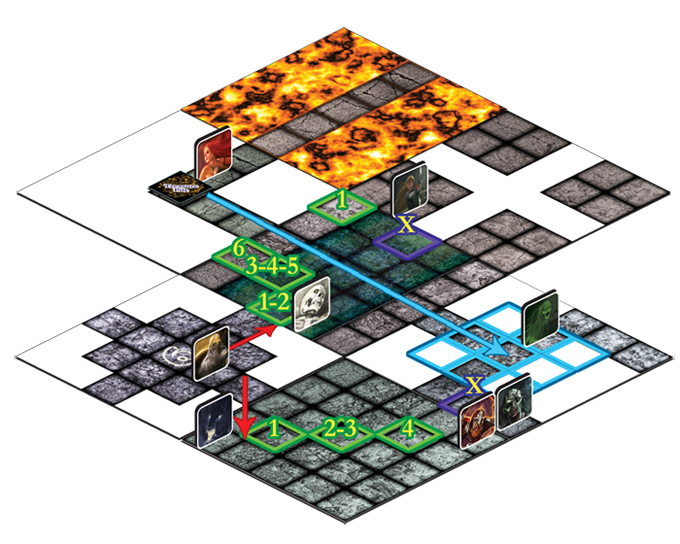 Although this is only a part of our plan, Labyrinth is an awesome miniatures board game. Made for 2-6 players, this strategy game is easy to learn and hard to master. Race to the center to get the treasure, you can even play on teams! This is our Print and Play for Free option! This game is far too massive for us to manufacture in a cost effective way, so we decided to make this in to what we call a "piece-meal" game. You can print up the parts yourself with the pdfs, and purchase the pieces as you like. Pieces you can print include; Rulebook, Play Mat (28 x 28), Game Tiles (x60), Game Cards (x99) & Game Tokens (x54). We encourage you to use your collection of PPMs and d6 dice that you may already have or purchase them from your local gaming store! Download the rulebook here, print it out, staple the center and make it a booklet. The booklet only requires 3 sheets of paper to print and is 600KB. We have updated the rules and card files as of Jan 22nd 2015! The Play Mat requires 10 printable sheets of cardstock (you can use paper, but we recommend cardstock) and 1 assembly reference page. These are high definition images and this file is 10MB. Tiles require 30 sheets of cardstock (you can use paper, but we recommend cardstock). These are high definition images and this file is 60MB. Cards require 11 sheets of cardstock or paper. These are high definition images and this file is 35MB. Tokens require 1 sheet of cardstock or paper. As an option we've provided some Standees that you can print up if you don't have minis. In case you wanted to expand on this game on your own, you can download the blank tile and card file for your own creativity. DCL Blanks print what you need! Once printed and cut, place all of the Mat pieces face up so that you can see the entire Mat. Then take the furthest left and right corners and swap them (keeping them face up), repeat this process with the two tiles that are just inside from those two parts. Do this all the way down the mat until all parts have been swapped except the center parts. Then flip over the parts exactly where they are so they face downwards. Now tape the parts together. Use card sleeves to colour code each deck and keep a uniform look which will help to hide the card details when face down. To keep the mystery alive when drawing Tiles, you can place the rulebook on top and just slide out the top Tile from underneath it, it's not perfect, but works pretty good. You can also put the Tiles in a box high enough and reach in to the top to grab them. If you have time rate us on BGG! 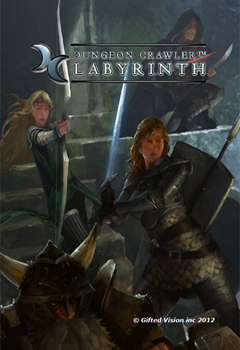 Dungeon Crawler™ Labyrinth is the copyrighted property of Gifted Vision inc and is not be sold, resold, or distributed without explicit permission from Gifted Vision inc.